What Ever Happened with New Zealand's Flag Referendum? PolGeoNow readers might remember that New Zealand's vote on whether to change its national flag was scheduled to continue until late March 24. So how did it turn out? Preliminary results were released on March 24, with detailed final results coming out six days later. The answer: New Zealanders voted "NO" on changing their country's flag to the proposed "Silver Fern" design, by a margin of 57% to 43%. 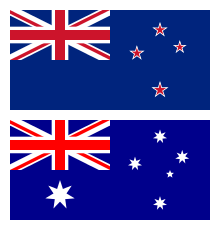 The result is that New Zealand will keep the same flag it's been using since 1902. Even though this design is confusingly similar to the Australian flag, and even though many New Zealanders liked the idea of a flag change, the government didn't suggest any designs that were popular enough to get a majority of voters behind them. If you're curious how each part of New Zealand voted, you can see a color-coded summary and map of the results on Wikipedia. Be be aware that the blue just represents regions that voted just over 50% in favor of changing the flag: No area had more than 52% of voters supporting the Silver Fern, and some of the red-coded areas also had almost 50% support for the change.